As a part of sweeping changes to its product lineup, Apple has also restructed the prices and tiers for iCloud storage upgrades, making the service more competitive with alternatives like Google Drive. While the default amount of storage is still just 5 gigabytes, paying 99 cents a month will now get a subscriber 50 gigabytes of storage instead of 20. Apple has also scaled back the prices for its 200-gigabyte and 1-terabyte tiers, adjusting them from $3.99 and $19.99 to $2.99 and $9.99, respectively. In the process Apple has eliminated a 500-gigabyte option, which previously cost as much as the new 1-terabyte level. Google Drive, by comparison, offers 15 gigabytes for free, and 100 gigabytes for $1.99 a month. Its 1 terabyte plan is identical to Apple's, however. Both companies are currently trumped by Microsoft's OneDrive, which offers 1 terabyte and an Office 365 subscription for $6.99. Apple announced the changes during its Wednesday press event, but has yet to update its official pricing guide. Improving iCloud storage may be necessary for a few reasons. On top of competitiveness, many people are backing up multiple devices to iCloud, and even a single iPhone backup can consume several gigabytes. 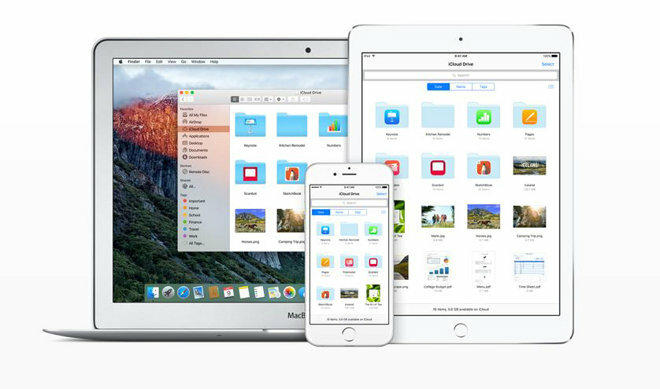 With iCloud Drive, Apple has also turned the service into a more open and easily browsable storage platform. An iCloud Drive app will come preloaded with iOS 9 when the latter launches on Sept. 16.